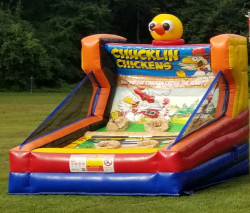 The Chucklin' Chicken Game is a combination of humorous fun and traditional carnival game play. Comes with plush chicken finger slingshots that make noise when shot. 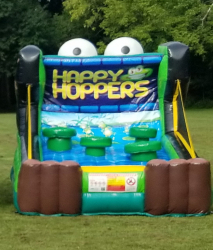 The Happy Hopper Game is a combination of humorous fun and traditional carnival game play. Comes with plush froggy finger slingshots that make noise when shot.